Abstract: Seizures and epilepsy are quite a common outcome of arterial ischemic stroke (AIS) both in pediatric and adult patients, with distinctly higher occurrence in children. These poststroke consequences affect patients’ lives, often causing disability. Poststroke seizure (PSS) may also increase mortality in patients with AIS. Early PSS (EPSS) occurring up to 7 days after AIS, late PSS (LPSS) occurring up to 2 years after the onset of AIS, as well as poststroke epilepsy (PSE) can be distinguished. However, the exact definition and cutoff point for PSE should be determined. A wide range of risk factors for seizures and epilepsy after AIS are still being detected and analyzed. More accurate knowledge on risk factors for PSS and PSE as well as possible prediction of epileptic seizures after the onset of AIS may have an impact on improving the prevention and treatment of PSE. The aim of the present review was to discuss current perspectives on diagnosis and treatment of PSS and PSE, both in adult and paediatric patients. Thus, due to all these discrepancies, more accurate knowledge on risk factors for PSS and epilepsy as well as the possibility to predict the occurrence of epileptic seizures may have an impact on improving the prevention and treatment of poststroke epilepsy (PSE). Prophylaxis with antiepileptic drugs (AEDs) for a defined period of time is in the field of special interests. The aim of the present review was to discuss current perspectives on diagnosis and treatment of epilepsy that may occur after AIS, both in adult and pediatric patients. The length of the follow-up period of stroke patients can be an indicator of the prevalence of PSE – the longer the follow-up, the higher the frequency of epilepsy after stroke. Despite that, the prevalence of PSS as well as PSE differs between populations, both in adults and pediatric patients. The prevalence of PSE in adult patients suffering from AIS has been shown to range from 2% to 4%.10 The frequency of PSS in adult patients is more or less at a similar level in different populations (Table 1). In a French study, 6.9% of patients with stroke had late poststroke seizure (LPSS), and a similar prevalence of late seizures was found by Roivainen et al in Finnish patients (6.1%).11,12 EPSS was distributed as follows: in French patients – 5.4%, in Finnish patients – 3.5%, and in Danish patients – 4.2%.11–13 Surprisingly, in patients with stroke (ischemic and hemorrhagic strokes were analyzed jointly) from Rajasthan, the frequency of EPSS and LPSS was especially high (54% and 46%, respectively) when compared to other data.14 The prevalence of PSE ranges from 1.6% in Taiwan population15 to 8.2% in German population.16 However, only the study by Kammersgaard and Olsen13 gave the exact definition of PSE, whereas in the study by Jungelhulsing et al,16 the patients were diagnosed as epileptic when they had at least one late poststroke epileptic seizure <2 years after initial stroke. Note: aIschemic stroke was analyzed jointly with hemorrhagic stroke. Abbreviations: AIS, arterial ischemic stroke; NA, not available; PSE, poststroke epilepsy; PSS, poststroke seizure. Table 2 shows the frequency of epileptic seizures appearing after ischemic stroke and PSE in pediatric populations. Compared to adult patients, the frequency of both seizures and epilepsy is higher in children. 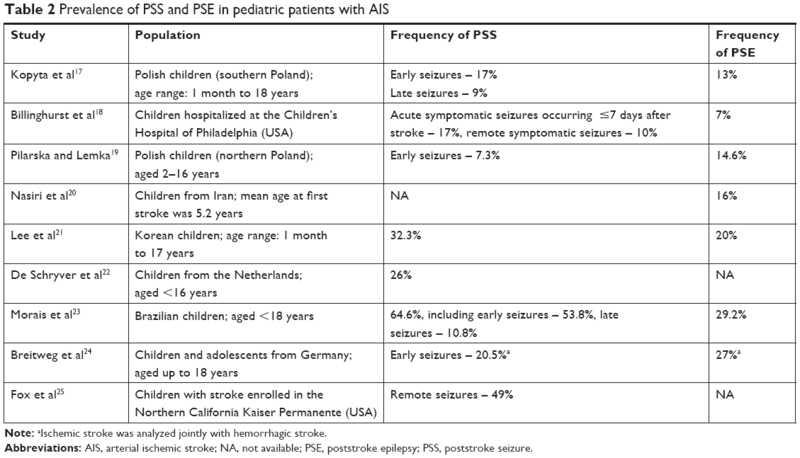 Available data on children stroke revealed that the lowest frequency of PSS, both early (17%) and late (9%), was observed in the study analyzing children hospitalized at a university medical center in southern Poland.17 A similar prevalence of acute symptomatic seizure appearing ≤7 days after stroke and remote symptomatic seizures was demonstrated in the study by Billinghurst et al, who retrospectively analyzed 105 patients with childhood stroke hospitalized at Children’s Hospital of Philadelphia, USA.18 However, surprisingly in this study, the percentages of patients with childhood AIS and PSE were almost twice lower than in the study by Kopyta et al (7% vs 13%, respectively).17 On the other hand, another study conducted in Poland, but in northern part, showed that the prevalence of cases with epilepsy was similar (14.6%) to the one reported in the study by Kopyta et al and defined early seizures as those occurring during the first 24 hours after stroke. However, it did not demonstrate the frequency of LPSS.19 Almost the same frequency of PSE was also observed in Iranian children (16%).20 A greater prevalence of PSS was in turn observed in the group of patients from the Netherlands and Korea (26% and 32.3%, respectively), and particularly high frequencies of PSS and epilepsy were found in Brazilian children with AIS (64.6% and 29.2%, respectively).21–23 In a Brazilian study, over half of the stroke children had early seizures and seizures evolved into epilepsy in almost 30% of pediatric patients. In the study by Breitweg et al,24 early seizures were present in >20% of children with stroke and PSE in 27% of patients. Moreover, in the study by Fox et al,25 almost half of the children with AIS had remote seizures. The current definition of epilepsy as well as the division of epileptic seizures recommended by ILAE have been used since 2014, so the studies published before that time are based on previous recommendations. Different sets of risk factors for PSS and PSE can be distinguished in patients with stroke. In adults, the most often demonstrated predictors are the stroke subtype, infarct size, location, and severity of ischemia. However, due to the different criteria of recruitment, the length of follow-up, as well as differences in the time of establishing EPSS and LPSS, inconsistent and even contradictory results are given on the topic. In adults, Jungehulsing et al16 observed that hypertension and stroke severity were significant predictors for PSE. In turn, in the study based on German patients, no relations between some metabolic factors and development of seizures were found.26 Surprisingly, according to the data of Devuyst et al,39 an elevated level of cholesterol may play a protective role in seizures and ischemic stroke. Moreover, Roivainen et al observed that cigarette smoking, heavy drinking, as well as infections preceding stroke were more frequent in patients having LPSS compared to patients with acute symptomatic seizures (up to 7 days after stroke onset).12 Univariate analysis performed by Conrad et al demonstrated that younger age of patients was associated with the occurrence of seizures.26 Similar findings were reported by other authors.40 In contrast, earlier data showed that patients aged >84 years had a higher risk of PSS.41 This may result from decreased excitability of the cortex due to the aging process of brain tissue. Other factors that increase the risk of PSE include the volume of infarcts (the larger the stroke, the greater the probability of having PSE), stroke severity, and location of infarcts (cortical location carries a greater risk of PSE).42–44 In the study by Misirli et al, the most important risk factor for the development of seizures was cortical involvement with the OR equal to 4.25.40 In turn, Conrad et al observed that cortical involvement is associated with late seizures.26 Some discrepancies may be noted in the context of correlations between the cortical location of stroke and the development of EPSS; some authors found such a relation while others did not.45,46 No significant difference in the location of stroke was also found between patients with and without PSS.35 Very interesting results were reported by Cordonnier et al, who demonstrated that preexisting dementia was independently related to the appearance of late seizures (OR=4.66), but not to early seizures.11 This finding may be explained by some dysfunction of glutamate pathways in people with dementia. Hesdorffer et al observed that the risk of subsequent unprovoked seizures is higher in the case of the occurrence of LPSS than in the case of early symptomatic seizures.38 The results of a Korean study indicated that some factors determining the high risk of the second seizure after the first one may emerge; the patients who are mostly endangered by the second seizure after the first one in follow-up are characterized by male gender, age below 65 years, large ischemic lesions, and focal seizures in clinical presentation.47 This may be helpful in making individual decisions about treatment administration after the first seizure. The latest data also show that intravenous tissue plasminogen activator therapy, which is approved for acute stroke treatment, may be a risk factor for subsequent PSE48 since it is suggested to cause some neurotoxicity. Likewise, using antidepressants was a significant risk factor for LPSS in the Finnish population, whereas using antipsychotic or anxiolytic medications characterized patients with both acute seizure and LPSS.12 One of the suggested risk factors for PSE is also hemorrhagic transformation.6,12 In our opinion, a family history of epilepsy should also be taken into account as a risk factor for PSE since genes contribute to epileptogenesis. In children suffering from ischemic stroke, an association between the G allele carrier-state in the −174G>C polymorphism in IL6 gene and PSE was demonstrated.51 The CC homozygotes were not found in children with stroke and subsequent epilepsy, whereas the CC genotype was observed in about 25% of children without PSE. A number of proinflammatory molecules can be released due to some brain injury (probably also as a result of ischemia) or proconvulsant events, which can activate microglia and astrocytes.54 These proinflammatory mediators may cause changes in neuronal excitability and then neuronal communications. Other interesting pilot data showed that the AA genotype of the 1298A>C polymorphism within the MTHFR gene may have a protective role in the development of seizures after stroke in pediatric patients (AA genotype was observed in almost 19% of children with seizures and in 43% of children without seizures).52 The 1298A>C polymorphism results in a decreased activity of MTHFR, but to a lesser extent than in the case of the MTHFR677C>T polymorphism. The decreased activity of the enzyme results in the elevated homocysteine level, which was suggested to cause neuronal excitotoxicity through overstimulation of the receptors of N-methyl-D-aspartate.55 Another study demonstrated that TT homozygotes of the rs2516839 polymorphism within the USF-1 gene, which is involved in lipid metabolism, were more frequent in AIS children with PSE.53 Previously, the results of an experimental study by Sirito et al56 showed the role of USF in normal brain function since the USF-deficient mice experienced spontaneous epileptic seizures. Even though the probability of subsequent unprovoked seizures after the first PSS is quite high in poststroke patients, the prophylaxis of the recurrent seizures with AEDs is not commonly practised.47 According to Tanaka et al, in Japan 33% of hospitals prescribe AEDs after the first late seizure compared to 88% prescribing AEDs after the second one.64 The exception would be the patients after status epilepticus as the first epilepsy manifestation.65 Although the early AED administration in poststroke patients does not modify the pathogenesis of the disease and prognosis, it may prevent the second seizure occurrence, especially that the risk of recurrent seizures after the first late-onset PSS is high and estimated at about one-third of patients.47,66 In turn, in the study by Ahangar et al,5 phenobarbital (PB) or phenytoin (PHT) was prescribed very early, ie, to each patient who had early- and late-onset PSS. The authors explain the later lower frequency of recurrent seizures with this early inclusion of anticonvulsant treatment. In presuming the occurrence of PSS, the role of EEG is also analyzed. The latest data show that the first EEG asymmetry can independently predict unprovoked seizures or epilepsy in the year following anterior circulation ischemic stroke.85 On the other hand, from a practical point of view, the asymmetry of EEG track in poststroke patients is just the result of ischemic brain injury and should be considered a potential PSE risk factor coexisting with others. All this shows the complexity of the causes of PSE and its prediction. Thus, the more knowledge on PSE, the more advanced, precise, or even individualized therapies will have the chance to be implemented. However, in the light of the reviewed data, the authors believe that the definition of PSE itself needs to be first refined and standardized, otherwise knowing the risk factors or the actual frequency of the disease will still be a problem. Hauser WA, Annegers JF, Kurland LT. Incidence of epilepsy and unprovoked seizures in Rochester, Minnesota: 1935–1984. Epilepsia. 1993;34(3):453–458. Chadehumbe MA, Khatri P, Khoury JC, et al. Seizures are common in the acute setting of childhood stroke: a population-based study. J Child Neurol. 2009;24(1):9–12. Yang H, Rajah G, Guo A, Wang Y, Wang Q. Pathogenesis of epileptic seizures and epilepsy after stroke. Neurol Res. 2018;40(6):426–432. Burneo JG, Fang J, Saposnik G; Investigators of the Registry of the Canadian Stroke Network. Impact of seizures on morbidity and mortality after stroke: a Canadian multi-centre cohort study. Eur J Neurol. 2010;17(1):52–58. Ahangar AA, Hosseini S, Saghebi R. Clinical features of post stroke seizure in Babol, northern Iran. Neurosciences. 2008;13(1):88–90. Alberti A, Paciaroni M, Caso V, Venti M, Palmerini F, Agnelli G. Early seizures in patients with acute stroke: frequency, predictive factors, and effect on clinical outcome. Vasc Health Risk Manag. 2008;4(3):715–720. Lee JC, Lin KL, Wang HS, et al. Seizures in childhood ischemic stroke in Taiwan. Brain Dev. 2009;31(4):294–299. De Reuck J, Sieben A, Van Maele G. Characteristics and outcomes of patients with seizures according to the time of onset in relation to stroke. Eur Neurol. 2008;59(5):225–228. Okuda S, Takano S, Ueno M, Hamaguchi H, Kanda F. Clinical features of late-onset poststroke seizures. J Stroke Cerebrovasc Dis. 2012;21(7):583–586. Kwan J. Stroke: predicting the risk of poststroke epilepsy – why and how? Nat Rev Neurol. 2010;6(10):532–533. Cordonnier C, Hénon H, Derambure P, Pasquier F, Leys D. Influence of pre-existing dementia on the risk of post-stroke epileptic seizures. J Neurol Neurosurg Psychiatry. 2005;76(12):1649–1653. Roivainen R, Haapaniemi E, Putaala J, Kaste M, Tatlisumak T. Young adult ischaemic stroke related acute symptomatic and late seizures: risk factors. Eur J Neurol. 2013;20(9):1247–1255. Kammersgaard LP, Olsen TS. Poststroke epilepsy in the Copenhagen stroke study: incidence and predictors. J Stroke Cerebrovasc Dis. 2005;14(5):210–214. Kamble S, Srivastava T, Sardana V. Clinical and radiological profile of post stroke seizures. Ind J Neurosci. 2017;3(1):8–12. Chen TC, Chen YY, Cheng PY, Lai CH. The incidence rate of post-stroke epilepsy: a 5-year follow-up study in Taiwan. Epilepsy Res. 2012;102(3):188–194. Jungehulsing GJ, Heuschmann PU, Holtkamp M, Schwab S, Kolominsky-Rabas PL. Incidence and predictors of post-stroke epilepsy. Acta Neurol Scand. 2013;127(6):427–430. Kopyta I, Sarecka-Hujar B, Skrzypek M. Post-stroke epilepsy in Polish paediatric patients. Dev Med Child Neurol. 2015;57(9):821–828. Billinghurst LL, Beslow LA, Abend NS, et al. Incidence and predictors of epilepsy after pediatric arterial ischemic stroke. Neurology. 2017;88(7):630–637. Pilarska E, Lemka M. Epileptic seizures and epilepsy in ischemic stroke in children. Neurol Dziec. 2007;16:23–27. Nasiri J, Ariyana A, Yaghini O, Ghazavi MR, Keikhah M, Salari M. Neurological outcome after arterial ischemic stroke in children. Adv Biomed Res. 2016;5:107. Lee EH, Yum MS, Ko TS. Risk factors and clinical outcomes of childhood ischemic stroke in a single Korean tertiary care center. J Child Neurol. 2012;27(4):485–491. De Schryver EL, Kappelle LJ, Jennekens-Schinkel A, Boudewyn Peters AC. Prognosis of ischemic stroke in childhood: a long-term follow-up study. Dev Med Child Neurol. 2000;42(5):313–318. Morais NM, Ranzan J, Riesgo RS. Predictors of epilepsy in children with cerebrovascular disease. J Child Neurol. 2013;28(11):1387–1391. Breitweg I, Stülpnagel CV, Pieper T, et al. Early seizures predict the development of epilepsy in children and adolescents with stroke. Eur J Paediatr Neurol. 2017;21(3):465–467. Fox CK, Glass HC, Sidney S, Lowenstein DH, Fullerton HJ. Acute seizures predict epilepsy after childhood stroke. Ann Neurol. 2013;74(2):249–256. Conrad J, Pawlowski M, Dogan M, Kovac S, Ritter MA, Evers S. Seizures after cerebrovascular events: risk factors and clinical features. Seizure. 2013;22(4):275–282. Myint PK, Staufenberg EF, Sabanathan K. Post-stroke seizure and post-stroke epilepsy. Postgrad Med J. 2006;82(971):568–572. ILAE (International League against Epilepsy). Commission on Classification and Terminology. Proposal for revised clinical and electroencephalographic classification of epileptic seizures. Epilepsia. 1981;22:489–501. Berg AT, Scheffer IE. New concepts in classification of the epilepsies: entering the 21st century. Epilepsia. 2011;52(6):1058–1062. Fisher RS, Acevedo C, Arzimanoglou A, et al. ILAE Official Report: a practical clinical definition of epilepsy. Epilepsia. 2014;55(4):475–482. Beslow LA, Abend NS, Gindville MC, et al. Pediatric intracerebral hemorrhage: acute symptomatic seizures and epilepsy. JAMA Neurol. 2013;70(4):448–454. Barker-Haliski M, White HS. Glutamatergic mechanisms associated with seizures and epilepsy. Cold Spring Harb Perspect Med. 2015;5(8):a022863. Luhmann HJ. Ischemia and lesion induced imbalances in cortical function. Prog Neurobiol. 1996;48(2):131–166. Uchino H, Smith ML, Bengzon J, Lundgren J, Siesjö BK. Characteristics of postischemic seizures in hyperglycemic rats. J Neurol Sci. 1996;139(1):21–27. Bryndziar T, Sedova P, Kramer NM, et al. Seizures following ischemic stroke: frequency of occurrence and impact on outcome in a long-term population-based study. J Stroke Cerebrovasc Dis. 2016;25(1):150–156. Strzelczyk A, Haag A, Raupach H, Herrendorf G, Hamer HM, Rosenow F. Prospective evaluation of a post-stroke epilepsy risk scale. J Neurol. 2010;257(8):1322–1326. Zelano J, Lundberg RG, Baars L, Hedegärd E, Kumlien E. Clinical course of poststroke epilepsy: a retrospective nested case-control study. Brain Behav. 2015;5(9):e00366. Hesdorffer DC, Benn EK, Cascino GD, Hauser WA. Is a first acute symptomatic seizure epilepsy? Mortality and risk for recurrent seizure. Epilepsia. 2009;50(5):1102–1108. Devuyst G, Karapanayiotides T, Hottinger I, van Melle G, Bogousslavsky J. Prodromal and early epileptic seizures in acute stroke: does higher serum cholesterol protect? Neurology. 2003;61(2):249–252. Misirli H, Özge A, Somay G, Erdoğan N, Erkal H, Erenoğlu NY. Seizure development after stroke. Int J Clin Pract. 2006;60(12):1536–1541. Burn J, Dennis M, Bamford J, Sandercock P, Wade D, Warlow C. Epileptic seizures after a first stroke: the Oxfordshire Community Stroke Project. BMJ. 1997;315(7122):1582–1587. Zelano J. Poststroke epilepsy: update and future directions. Ther Adv Neurol Disord. 2016;9(5):424–435. Beghi E, D’Alessandro R, Beretta S, et al. Incidence and predictors of acute symptomatic seizures after stroke. Neurology. 2011;77(20):1785–1793. Kulhari A, Strbian D, Sundararajan S. Illustrative teaching case: early onset seizures in stroke. Stroke. 2014;45:e249–e251. Lamy C, Domigo V, Semah F; Patent Foramen Ovale and Atrial Septal Aneurysm Study Group. Early and late seizures after cryptogenic ischemic stroke in young adults. Neurology. 2003;60:400–404. Reith J, Jørgensen HS, Nakayama H, Raaschou HO, Olsen TS. Seizures in acute stroke: predictors and prognostic significance. Stroke. 1997;28(8):1585–1589. Kim HJ, Park KD, Choi KG, Lee HW. Clinical predictors of seizure recurrence after the first post-ischemic stroke seizure. BMC Neurol. 2016;16(1):212. Naylor J, Thevathasan A, Churilov L, et al. Association between different acute stroke therapies and development of post stroke seizures. BMC Neurol. 2018;18(1):61. Yang H, Song Z, Yang GP, et al. The ALDH2 rs671 polymorphism affects post-stroke epilepsy susceptibility and plasma 4-HNE levels. PLoS One. 2014;9(10):e109634. Zhang B, Chen M, Yang H, Wu T, Song C, Guo R. Evidence for involvement of the CD40/CD40L system in post-stroke epilepsy. Neurosci Lett. 2014;567:6–10. Balcerzyk A, Nowak M, Kopyta I, et al. Impact of the -174G/C interleukin-6 (IL-6) gene polymorphism on the risk of paediatric ischemic stroke, its symptoms and outcome. Folia Neuropathol. 2012;50(2):147–151. Smulska N. Outcome after pediatric stroke: investigation genes polymorphism. Eur J Ped Neurol. 2015;19(Suppl 1):S151–S152. Balcerzyk A, Niemiec P, Iwanicki T, et al. Upstream stimulating factor 1 (USF-1) gene polymorphisms and the risk, symptoms, and outcome of pediatric ischemic stroke. J Stroke Cerebrovasc Dis. 2018;27(7):1885–1889. Vezzani A, Aronica E, Mazarati A, Pittman QJ. Epilepsy and brain inflammation. Exp Neurol. 2013;244:11–21. Lipton SA, Kim WK, Choi YB, et al. Neurotoxicity associated with dual actions of homocysteine at the N-methyl-D-aspartate receptor. Proc Natl Acad Sci. 1997;94(11):5923–5928. Sirito M, Lin Q, Deng JM, Behringer RR, Sawadogo M. Overlapping roles and asymmetrical cross-regulation of the USF proteins in mice. Proc Natl Acad Sci. 1998;95(7):3758–3763. Winstein CJ, Stein J, Arena R, et al. Guidelines for adult stroke rehabilitation and recovery: a guideline for healthcare professionals from the American Heart Association/American Stroke Association. Stroke. 2016;47(6):e98–e169. Kim JE, Choi HC, Song HK, et al. Levetiracetam inhibits interleukin-1 beta inflammatory responses in the hippocampus and piriform cortex of epileptic rats. Neurosci Lett. 2010;471(2):94–99. Ceolin L, Bortolotto ZA, Bannister N, Collingridge GL, Lodge D, Volianskis A. A novel anti-epileptic agent, perampanel, selectively inhibits AMPA receptor-mediated synaptic transmission in the hippocampus. Neurochem Int. 2012;61(4):517–522. Ma L, Cui XL, Wang Y, et al. Aspirin attenuates spontaneous recurrent seizures and inhibits hippocampal neuronal loss, mossy fiber sprouting and aberrant neurogenesis following pilocarpine-induced status epilepticus in rats. Brain Res. 2012;1469:103–113. Sunnen CN, Brewster AL, Lugo JN, et al. Inhibition of the mammalian target of rapamycin blocks epilepsy progression in NS-Pten conditional knockout mice. Epilepsia. 2011;52(11):2065–2075. Guo J, Guo J, Li J, et al. Statin treatment reduces the risk of poststroke seizures. Neurology. 2015;85(8):701–707. Etminan M, Samii A, Brophy JM. Statin use and risk of epilepsy: a nested case-control study. Neurology. 2010;75(17):1496–1500. Tanaka T, Ihara M. Post-stroke epilepsy. Neurochem Int. 2017;107:219–228. Beleza P. Acute symptomatic seizures: a clinically oriented review. Neurologist. 2012;18(3):109–119. Tanaka T, Yamagami H, Ihara M, et al. Seizure outcomes and predictors of recurrent post-stroke seizure: a retrospective observational cohort study. PLoS One. 2015;10(8):e0136200. Alvarez-Sabín J, Montaner J, Padró L, et al. Gabapentin in late-onset poststroke seizures. Neurology. 2002;59(12):1991–1993. Oros MM, Smolanka VI, Sofilkanich NV, Borovik OI, Luts VV, Andrukh PG. Epilepsy after ishemic stroke: is it worth administering anticonvulsants after the first attack? Wiad Lek. 2018;71(2 Pt 1):269–272. Silverman IE, Restrepo L, Mathews GC. Poststroke seizures. Arch Neurol. 2002;59(2):195–202. Inoue Y, Nakamura F, Nishida T. Treatment guidelines for adult epilepsy. Rinsho Shinkeigaku. 2004;44(11):861–864. Pugh MJ, Van Cott AC, Cramer JA, et al. Trends in antiepileptic drug prescribing for older patients with new-onset epilepsy: 2000–2004. Neurology. 2008;70(22 Pt 2):2171–2178. Pugh MJ, Knoefel JE, Mortensen EM, Amuan ME, Berlowitz DR, van Cott AC. New-onset epilepsy risk factors in older veterans. J Am Geriatr Soc. 2009;57(2):237–242. Johnell K, Fastbom J. Antiepileptic drug use in community-dwelling and institutionalized elderly: a nationwide study of over 1,300,000 older people. Eur J Clin Pharmacol. 2011;67(10):1069–1075. Gilad R, Sadeh M, Rapoport A. Monotherapy of lamotrigine versus carbamazepine in patients with poststroke seizure. Clin Neuropharmacol. 2007;30(4):189–195. Huang YH, Chi NF, Kuan YC, et al. Efficacy of phenytoin, valproic acid, carbamazepine and new antiepileptic drugs on control of late-onset post-stroke epilepsy in Taiwan. Eur J Neurol. 2015;22(11):1459–1468. Stephen LJ, Kwan P, Brodie MJ. Does the cause of localisation-related epilepsy influence the response to antiepileptic drug treatment? Epilepsia. 2001;42(3):357–362. Scavarda D, Major P, Lortie A, Mercier C, Carmant L. Periinsular hemispherotomy in children with stroke-induced refractory epilepsy. J Neurosurg Pediatr. 2009;98(2):115–120. Brailowsky S, Knight RT, Efron R. Phenytoin increases the severity of cortical hemiplegia in rats. Brain Res. 1986;376(1):71–77. Hernandez TD, Russell LC. Phenobarbital delays recovery from cortex damage. Soc Neurosci Abstr. 1992;18:870. Schallert T, Hernandez TD, Barth TM. Recovery of function after brain damage: severe and chronic disruption by diazepam. Brain Res. 1986;379(1):104–111. Markowitz GJ, Kadam SD, Smith DR, Johnston MV, Comi AM. Different effects of high- and low-dose phenobarbital on post-stroke seizure suppression and recovery in immature CD1 mice. Epilepsy Res. 2011;94(3):138–148. Galovic M, Döhler N, Erdélyi-Canavese B, et al. Prediction of late seizures after ischaemic stroke with a novel prognostic model (the SeLECT score): a multivariable prediction model development and validation study. Lancet Neurol. 2018;17(2):143–152. Finsterer J. The SeLECT score is inappropriate to predict post-stroke epilepsy. Lancet Neurol. 2018;17(2):106–107. Bentes C, Martins H, Peralta AR, et al. Early EEG predicts poststroke epilepsy. Epilepsia Open. 2018;3(2):203–212.